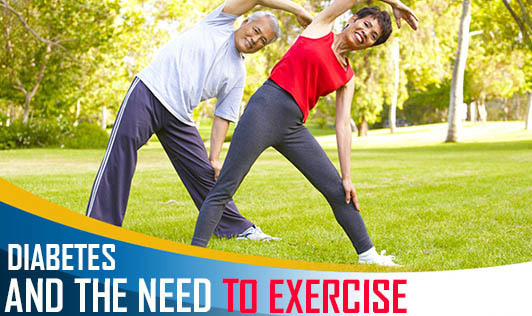 If you have diabetes exercise is one of the most powerful tools that can help you control your weight and blood sugar. And it can help you feel great, too. The list of exercise benefits is long but we will mention only the ones that are important for people with diabetes. Increase the body's sensitivity to insulin. Many studies have documented that exercise is a strong ally in treating diabetes. Exercising for at least 150 minutes for a minimum of 3 days a week can help you prevent or manage diabetes. Exercise can help you reduce weight and according to studies reducing 5-10% of body weight can cut down your diabetes risk by 58%. Walking- People with diabetes who walked at least two hours a week were less likely to die of heart disease than their sedentary counterparts, and those who exercised three to four hours a week cut their risk even more. Importance of interrupting periods of prolonged sitting with light physical activities like leg extensions, walking, desk chair swirls and overhead arm stretches in addition to regular exercise to prevent or manage diabetes. Lifestyle changes that focus specifically on diet and exercise are the best way to prevent type 2 diabetes from developing and getting worse, and if you are overweight and have been told that you are at a higher risk for diabetes—or that you already have pre-diabetes—taking right action today will help you lower your risk altogether and put you on the path of prevention and improved health. If you have diabetes, generally it is best to exercise one to three hours after eating, when your blood sugar level is likely to be higher. If you use insulin, be sure to test your blood sugar before exercising. If it is below 100 mg/dL, eat a piece of fruit or have a small snack. This will bump your blood sugar up and help you avoid hypoglycemia. Test again 30 minutes after your snack to be sure your blood sugar level is stable. It's also a good idea to check your blood sugar after any particularly grueling workout or activity. If you're taking insulin, your risk of developing hypoglycemia may be highest six to 12 hours after exercising. Experts also caution against exercising if your blood sugar is too high (over 250 mg/dL).